Introduction: Battled with an ageing population and shrinking workforce, organisations are doing more with less and as a result, focus is moving away from traditional human resources processes to more sophisticated organisational design strategies and approaches. The Australian Government’s recent release of the 2015 Intergenerational Report provides insight into such challenges facing Australia. However, driving higher levels of prosperity through economic growth, will also require increasing participation and productivity through opportunities that are ‘meaningful’ for the worker. Older Australians and women to enter or re-enter and stay in work requires a new way of thinking. Australia’s ageing population and shrinking workforce is influencing current policy discussions of higher immigration rates. IBISworld reports that in 2014-15, migration intake is expected to reach 203,800 people, 90% above that seen in 1999-2000. Multiculturalism introduces great opportunities and diversity of thought for organisations who are prepared to embrace the many benefits associated with a culturally diverse workforce. Designing meaningful jobs that take into consideration the varying skill levels and cultural differences won’t be an add-on but a major competitive advantage that is likely to underpin many workforce initiatives. The traditional notion of going to ‘the office’ is also shifting. The flexibility created with advancing technology means most jobs can be performed anywhere. We are therefore likely to see increases in the hours worked leading to greater productivity and the emergence of virtual organisations or hybrids of such as meaningful ways of designing jobs. 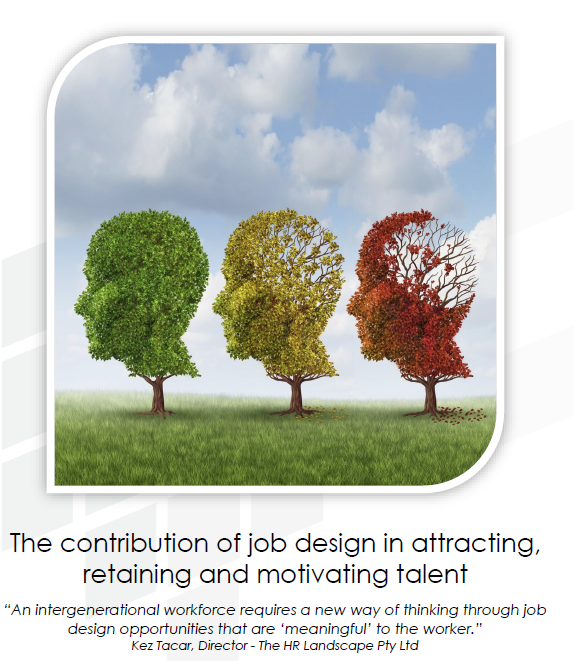 In light of these overwhelming challenges, we review the contribution of job design to particular organisational challenges such as workforce participation and productivity (attracting, retaining and motivating talent) in the context of an ageing, intergenerational and culturally diverse workforce. Please include your details to download paper.